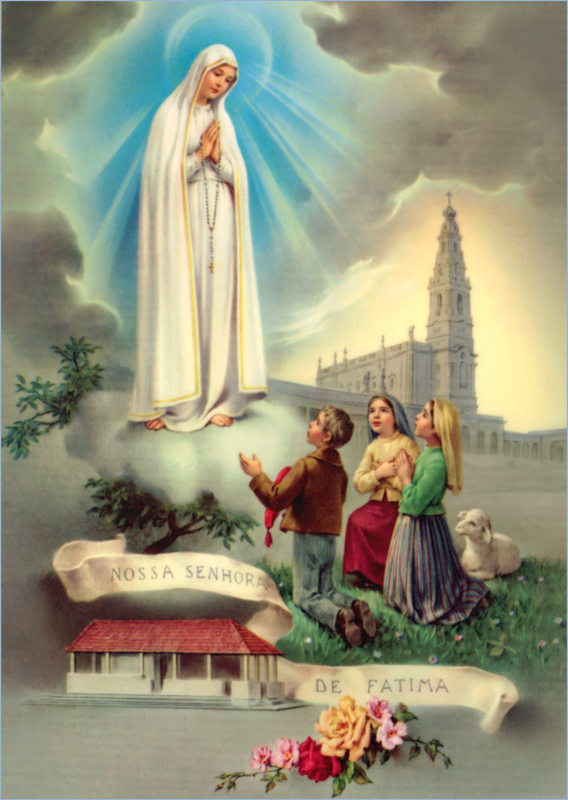 Our Lady of Fatima is the patroness of Portugal. The twentieth century was the first time in history where we ourselves had the ability to destroy not only the entire human race but all other forms of life on this planet. During World War I, the violence of which people had never seen before, Mary came to Fatima with a very serious warning. Expressing the belief that humankind had drifted away from God, she wanted the world to offer up reparations for the disastrous state of the earth. Fatima is the most prophetic of Mary’s apparitions. She correctly foretold the suffering imposed by the Communist states and the carnage of World War II. The third secret of Fatima was deemed too terrifying to release. It was finally revealed by the Vatican on May 13, 2000, in the hopes of what it had predicted had passed. Others strongly disagree with the Vatican’s interpretation and insist it is a portent of the end of the world. Our Lady of Fatima is an angry, pained mother, demanding that her children take action before it is too late. It is said that Mary usually appears to the simplest and least complicated of people because they do not try to judge or interpret what she says, they merely report it. For this reason, many times her visionaries are children. In 1916, a nine-year-old girl from Fatima, Portugal, named Lucia dos Santos was out tending sheep with her two younger cousins, Francisco and Jacinta. They were happily playing a little game with stones when they saw an immense light come from the sky in their direction. At the center of the light was a translucent angelic form. This was not the first time Lucia had seen this angel. When she had previously tended sheep with other companions she had witnessed the light of the angel overhead. When her friends had told their parents what they had seen, they were all accused of fabricating a story out of boredom. Because of this, Jacinta convinced her younger cousins to keep the angelic visit a secret. All three children began praying in the manner taught to them by the angel. Toward the end of summer they received another visit from the angel admonishing them for frittering so much time away in play. He told them he was Guardian Angel of Portugal and that God was offended by the sins of others. He advised the children to pray more and “Above all, accept and bear with submission, all the suffering which the Lord allows in your lives. In this way you will draw down peace upon your country.” Before winter came they received one more visit from this angel telling them that Jesus Christ was outraged by ungrateful and indifferent men. He implored them to keep praying and gave them Communion. Lucia’s family and friends greeted her story about the lady with scorn and mockery. Her cousins had a different experience. Their father believing that they truly had some sort of celestial vision, protected and respected them. On June 13 about fifty people accompanied the children to the Cova da Iria. Lucia called Jacinta out of a group of playing children, the lightning had started to flash even though it was a beautiful day. Lucia, Jacinta, and Francisco ran toward the oak tree where they had seen the lady a month before. Though others in the crowd could not see her, some reported hearing a “buzzing noise” or a “tiny little voice.” The lady, enveloped in a mystical light, taught the children a prayer, and made the following promise to the world, “I promise salvation to those who embrace devotion to my Immaculate Heart. Their souls will be loved by God as flowers placed by me to adorn His throne. These souls will suffer a great deal but I will never leave them. My Immaculate Heart will be their refuge, the way that will lead them to God.” She again showered the children with light from her hands. People in the crowd heard a “rushing sound” and the three children shouted, “There she goes, there she goes!” as they pointed to the sky in the east. To everyone’s amazement, the branches of the tree, which had been standing straight up a few minutes before, were also pointing to the east. The third visit, which took place on July 13 was attended by thousands of believers, cynics, and those searching for miracles. Lucia has written that between the past month and this day she was continually tormented by self-doubt. No one in her immediate family seemed to believe her, perhaps this was all a trick of her mind. The large crowd quieted down as they heard a buzzing sound. A cloud moved in over the oak tree. They watched as Lucia, enraptured, appeared to be having a conversation with the cloud. At one point, the girl cried out in horror. After a few minutes, there was the sound of thunder and the cloud lifted. The children waved good-bye to it. When asked what made her cry out, Lucia said, “It was a secret.” In her own memoirs, she wrote that as the lady started to appear all her doubts about whether this was really happening or not left her forever. In this visit, the famous Three Secrets of Fatima were imparted to the children. The local government looked upon the growing interest in the alleged apparitions in Fatima as a dangerous threat to its sovereignty. The royalists had recently been driven out of government and religion was looked upon as equaling royalism. Many monasteries and parochial schools had been closed down. The prime minister had promised that within twenty years all trace of religion would be gone from Portugal. The fourth apparition of the lady took place on August 13. Almost fifteen thousand people were gathered in the Cova da Iria, but Lucia, Jacinta and Francisco were locked in the town jail. Even without the seers the crowd witnessed the cloud hovering over the oak tree, there were sounds of explosions, and the ground shook A mystical light showered the crowd, reflecting all the colors of the rainbow. While this was happening, each of the children were separately questioned for hours. They refused to give up the secrets they were told by the lady. Though each was told that the other had completely recanted their story of the lady, not one of them would change their personal account. As a last resort the mayor told them that obviously there were no secrets, and he was going to boil them in oil if they did not admit the apparitions were all a lie. Instead of collapsing in hysteria, the three remained silent, and the children were released on August 15. The lady came to them in the area near their village and told them she wanted them to continue their pilgrimages to the Cova da Iria on the thirteenth of the month. She also told them to pray the rosary every day. “Pray. Pray very much, and make sacrifices for sinners. So many souls go to hell because there is no one to pray and make sacrifices for them.” The seriousness with which the children took her words greatly altered their personalities. Neighbors who once mocked them became their biggest defenders. By the September 13 apparition, there were over thirty thousand people in the Cova da Iria. In the middle of a cloudless sky, many witnessed a luminous globe moving from east to west. According to Lucia, the lady asked the people to pray the rosary to obtain the end of the war. She also promised that she would perform a miracle on her next and last visit so that everyone would believe. The apparition of October 13 is widely documented and was reported by newspapers all over the world. Even the most anticlerical Portuguese news agencies reported that there were “strange natural phenomenon” that had occurred in front of a crowd of at least fifty thousand people. Despite heavy rains, pilgrims arrived to the little town, most of them on foot. A few minutes before 1:30 in the afternoon it stopped raining. What happened next has been detailed by news reporters (most of whom were extremely skeptical of the children), eyewitnesses in the crowd, professors from the university, government officials, and even those who lived miles away. The sun appeared through the clouds, shone very brightly, and began to tremble and dance, whirling through the sky in a dizzying speed it cast all the colors of the rainbow on the crowd. The crowd began shouting for the Virgin Mary. The strange movements and light from the sun lasted a few minutes before returning to its natural place in the sky. The crowd, who had been soaked to the skin were now completely dry. As for the children, they were unaware of any “dance of the sun,” they had been communing with Mary. The story of Our Lady of Fatima had worldwide repercussions, and Fatima became a major pilgrimage site. It is visited by 5 million Marian devotees a year. The three seers were hounded by the sick, the desperate, and the curious. Jacinta and Francisco died during the flu epidemic of 1918. Lucia joined a convent in May 1921. She is still alive at this writing. The first part is the vision of hell. Our Lady showed us a great sea of fire which seemed to be under the earth. Plunged in this fire were demons and souls in human form, like transparent burning embers, all blackened or burnished bronze, floating about in the conflagration, now raised into the air by flames that issued from within themselves together with great clouds of smoke, now falling back on every side like sparks in a huge fire, without weight or equilibrium, and amid shrieks and groans fo pain and despair, which horrified us and made us tremble with fear. The demons could be distinguished by their terrifying and repulsive likeness to frightful and unknown animals, all black and transparent. This vision lasted but an instant. How can we ever be grateful enough to our kind heavenly mother, who had already prepared us by promising, in the first apparition, to take us to heaven. Otherwise, I think we would have died of fear and terror. We then looked up at Our Lady, who said to us so kindly and sadly, “You have seen hell where the souls of poor sinners go. To save them, God wishes to establish in the world devotion to my Immaculate Heart. If what I say to you is done, many souls will be saved and there will be peace. The war is going to end: but if people do not cease offending God, a worse one will break out during the Pontificate of Pius XI. When you see a night illumined by an unknown light, know that this is the great sign given you by God that he is about to punish the world for its crimes, by means of war, famine and persecutions of the Church. The good will be martyred; the Holy Father will have much to suffer; various nations will be annihilated. In the end, my Immaculate Heart will triumph. The Holy Father will consecrate Russia to me, and she shall be converted, and a period of peace will be granted the world. Lucia was so confused by the content of the third secret, that she placed it in an envelope and sent it to the Vatican with the instructions that it was not to be opened until the year 1960. Pope John XXIII chose not to release it upon reading it, Paul VI also kept it a secret. On May 13, 1981, the Feast of Our Lady of Fatima, an assassin fired a bullet at Pope John Paul II as he was out greeting the pilgrims in Saint Peter’s Square. He impulsively bent down to hug a little girl wearing an Our Lady of Fatima medal and the bullet only wounded him instead of killing him. He has always credited Our Lady of Fatima with saving his life. It was he who decided to release the third secret on May 13, 2000, to mark the beatification of Francisco and Jacinta. Lucia met with him beforehand and approved of the action. After the two parts which I have already explained, at the left of Our Lady and a little above, we saw an Angel with a flaming sword in his left hand; flashing, it gave out flames that looked as though they would set the world on fire; but they died out in contact with the splendor that Our Lady radiated towards him from her right hand: pointing to the earth with his right hand, the angel cried out: “Penance, Penance, Penance.” And we saw in an immense light that is God: something similar to how people appear in a mirror when they pass in front of it, a bishop dressed in white, we had the impression it was the Holy Father. Other bishops, priests, men and women religious going up a steep mountain, at the top of which there was a big cross of rough-hewn trunks of a cork-tree with the bark; before reaching there the Holy Father passed through a big city half in ruins and trembling with halting step, afflicted with pain and sorrow, he prayed for the souls of the corpses he met on his way. Having reached the top of the mountain, on his knees at the foot of the big cross he was killed by a group of soldiers who fired bullets and arrows at him, and in the same way there died one after another the other bishops, priests, men and women religious, and various lay people of different ranks and positions. Beneath the two arms of the cross there were two angels each with a crystal aspersorium in his hand, in which they gathered up the blood of the martyrs and with it sprinkled the souls that were making their way to God. Pope John Paul II felt that this last secret was a symbol of the attempt on his life. The Russian Revolution brought into the world a society that outlawed spirituality and religious practices. By the last half of the twentieth century, communism had engulfed many nations under this umbrella. Coming from Poland, Pope John Paul II was a force to be reckoned with. He inspired many in those countries to rebel against the totalitarian system. He felt the prayers Our Lady of Fatima asked for helped to change the course of history and the visions given to the three children.